The best food for me must be simple to make. 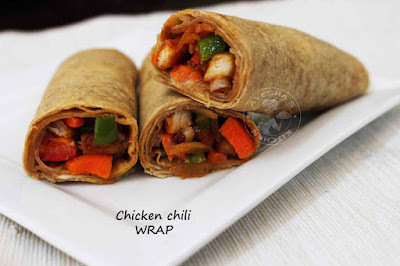 I often go for chicken wraps or veggie wraps for dinner and for my hubby tiffin food. Mostly I struggle hard to make breakfast and dinner meals. I love this type of super quick food for dinner instead of making the main course, side dish, salad and all. A single wrap with all the above-said items!!!! Here the chicken chili is wrapped in whole wheat chapati along with a garlic dip spread. So you can also use a tortilla instead. Adding variety to meals are always entertained in my family. My picky eater and my toddler are very crazy about finger foods and such wraps. So I used to try something different but must be simplest too. The fillings are up to our taste and preference. You can add lettuce and other veggies to make your dinner more filling. You can also add the crispy fried chicken strips along with veggies without any gravy or sauce to make a crispy chicken wrap. Hoping this easy chicken wrap recipe will surely make your weekend simple humble and yummy. Here is the recipe showing how to make chicken wraps/chicken chili wrap / quick dinner ideas/tortilla wraps/chicken wrap recipes /wrap food. Boneless chicken pieces are required for this recipe. So make thin strips of boneless chicken, wash well and pat dry. Grind together all the ingredients under 'for marination' EXCEPT CORNFLOUR to a fine paste. No need of adding water. Marinate the chicken strips with this marinade and then add cornflour. Combine well. Heat a nonstick pan with butter and stir fry the chopped carrot and bell peppers for 3 minutes and set aside. You can sprinkle salt if required. In the same pan, add oil for frying the marinated chicken strips. Fry until golden and set aside. Fry in batches. Now make the gravy. Heat 2 tbsp of oil and saute the onion for a while and then add the chopped garlic. Toss for a while and add the sauce (combine together tomato sauce and red chili sauce in a bowl). Mix well and then add the fried chicken strips. Let it cook for few minutes until the chicken is well coated in the sauce gravy. When done, set aside. Now make the garlic paste. Grind together all the ingredients given under ' for garlic paste' to a fine smooth paste. Set aside. Here I used whole wheat chapati for making this chicken chili wrap. You can use pita bread, nan, paratha instead. Take a chapati. Spread a teaspoon of garlic paste (can add more), followed by a layer of stir-fried veggies and chicken chili, and then again top it with some garlic paste. Wrap it tightly and serve. Delicious chicken chili wrap ready.